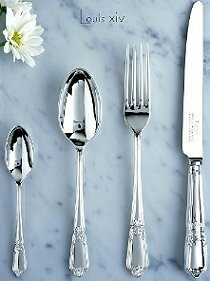 Sheffield, England has a long-standing international reputation for producing the finest flatware and cutlery products. 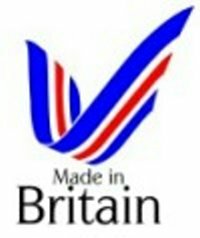 If you are looking for top quality cutlery/flatware and you wish to be assured of the best quality cutlery that can be found anywhere in the world, then the words "Made In Sheffield" are your assurance of that standard. Cutlery can be viewed via the Showroom with a wide choice of patterns in varying sizes of place settings and individual pieces. If you only need to purchase a few individual pieces e.g. 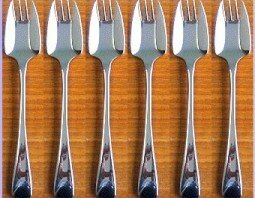 replacement items for missing pieces, please see the Loose Cutlery Items section for further guidance. Available in 18/10 Stainless Steel, 20 Year Silver Plate, 30 Year Silver plate, 40 Year Silver Plate and Sterling Silver. 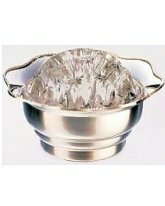 Available in 18/10 Stainless Steel, Sovereign Silver plate and Sterling Silver. Available in Sterling Silver. Made In Sheffield. Click for images and ordering. Available in 18/10 Stainless Steel. Range of patterns. Click for images and ordering. 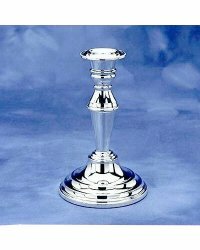 Available in Sovereign Silver Plate. Cutlery as used on the Titanic. Panel Reed pattern. Available in 18/10 Stainless Steel. Range of patterns. Available in 18/10 Stainless Steel With Gold Highlights, Silver Plate With Gold Highlights or Gold Plate. Available in 18/10 Stainless Steel. Mirage pattern. Click for images and ordering. Available in 18/10 Stainless Steel. Click for images and ordering. Available in 18/10 Stainless Steel with Gold Highlights. Presentation Boxes, Canvas Knife Wallets, Cloth Rolls, Canteens & Cabinets. Various sizes and capacities. 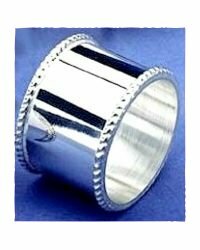 Cloth Rolls, Impregnated Silver Cloths, Polishing Mitts, Silver Foam and Polish. Special Offers Clearance and Reduced Price Items. 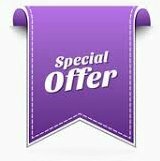 Items or sets here will be special one-off offers. Made by The World-Renown Arthur Wright Workshop. 100% Made in Sheffield. These pocket knives show the true craftsmanship of the Sheffield knife maker. These traditional Sheffield pocket/pen knives are made with many decades' experience of knife making. Choice of blades and handles. The knife handles are all natural materials. The blades are carbon steel with Brass linings & nickel bolsters. 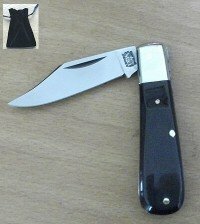 Whittling knives also available. Made either by 'Little Mester' Reg Cooper or from The Arthur Wright's Workshop. All are Made In Sheffield. These are fantastic traditional Bowie Knives. Sheffield steel has an international reputation for quality and these Bowie knives are no exception. These Knives are gleaming in appearance and the handles are made from a choice of materials that enhances the overall look and feel of the knives. Sizes range from 4" to 16" long. Hand-Crafted by The Arthur Wright Workshop with genuine Stag handles and Leather Sheaths. 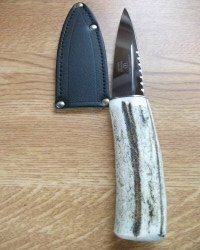 Traditional Scottish knife accessories. The instrument is tucked inside the the top of the kilt with only the upper portion showing and is usually worn on the right leg. You may also see them referred to as either "Skene-Dhu", "Skean-Dhu" or "Dirks". 4" Stainless Steel blade with jimping. Made In Sheffield. 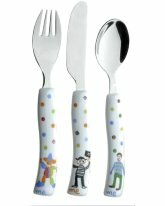 Ergonomically designed 3 & 4 Piece child's cutlery sets in either stainless steel and silver plate, "Year" spoons and sets, Minion bowls, plates and cups, egg cups, stainless/silver plated cutlery, frames, napkin rings, rattles, music carousels, rattles, child's tankards etc. 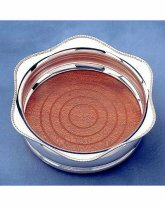 Round Embossed Gallery Trays with or without handles in various sizes, Chippendale Salvers in a range of sizes, Posy Bowls with Glass Inserts & Bead Border, Petal-Style Mounted Rose Bowls etc. Make the table sparkle with this selection of Napkin Rings available as either single items or in sets of 4, 3 piece Condiments Sets with or without Tray, Grape Scissors, 6" / 9" Table Mats, Tea Strainers etc. 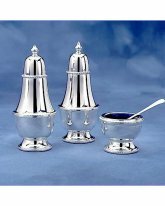 A selection of accessories including silver plated Bottle Coasters with wooden or metal bases, Bottle Stoppers, Contemporary Brandy Warmers, Cocktail Shakers, Drinks Mats, Pewter Hip Flasks, Ice Buckets, Shot Glasses etc. 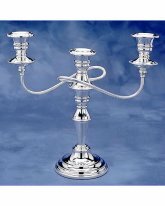 Candlesticks and Candleabra's - 3-Light or Single Candle, Classic, Dual-Purpose, Tall, Slim, 3-Arm, Twisted-Arm, Beaded Edge etc. Pairs or single items. 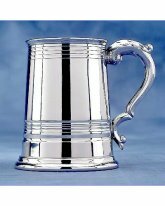 Pewter Tankards in either Pint or half Pint sizes. Various styles available - Georgian, Old-English, Half-Hammered, Straight-Sided, Worcester etc. All tankards are presented in a gift box. Scalloped edge knives for perfect cutting time after time. The scallop shape also gives strength in the knife blade. This ensures that each knife performs perfectly for the longest possible time by retaining a fine, razor sharp cutting edge. Wide choice of knives and slicers available. The traditional knives are manufactured using 400 years' experience. The plain edge knives are popular in the meat trade where their strength, sharpness and durability are perfect for the heavy use that these tradesmen employ every day. Range of knives and slicers available. The Wavy Edge provides the perfect cutting edge profile for cutting items such as bread, gateaux and pastry products. These knives are suitable for restaurants, canteens, fast food establishments etc, where a lot of use is required but when you want something that will last and stand up to frequent usage. The edge requires no/very little sharpening. Range of kitchen accessories and tools including Apple Corers, Ceramic Knives, Cook's Forks, Graters & Slicers, Jar & Bottle Openers, Knife Sharpeners, Potato Peelers etc. 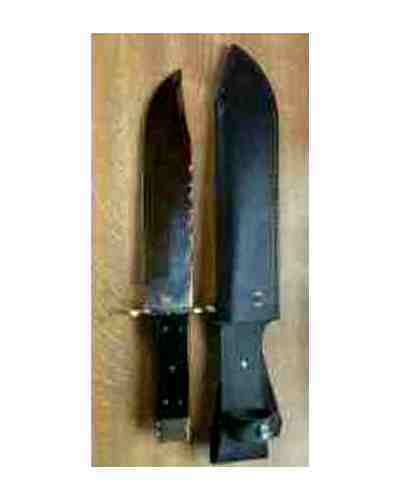 Stag and Moulded Plastic handled knife sets. Carving Knives, Steak Knives, Kitchen Knives etc. Some with Granton Edges. Optional Presentation Boxes. These items include Awls, Ham/Beef Needles, Long Kebab Knives, Meat Cleavers, Meat Slicers, Replacement Saws and Saw Blades, Skewers etc. These include Griddle Scrapers, Onion Knives, Pocket Steels, Radish Knives, Shellfish Knives etc. Choice of handle colours and polished blade sizes. Sharpening steels in a selection of sizes and finishes. Range from plastic/economy to diamond cut. 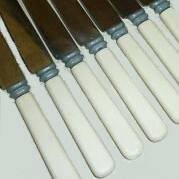 Various colours of handle available. 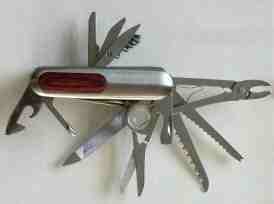 Multi-Function Tool with 15 accessories. 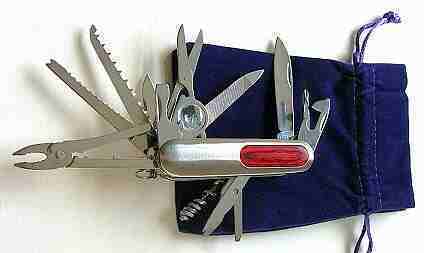 Penknife, Phillips Screwdriver, Flat Screwdriver, Small Penknife, Can Opener, Bottle Opener, Magnifying Lens. Wire Cutters, Scissors. Fish Scaler, Saw, File, Watch Screwdriver, Corkscrew Point for Threading Cord. Special Offer - Buy One Get One Free. Supplied with velvet pouch. 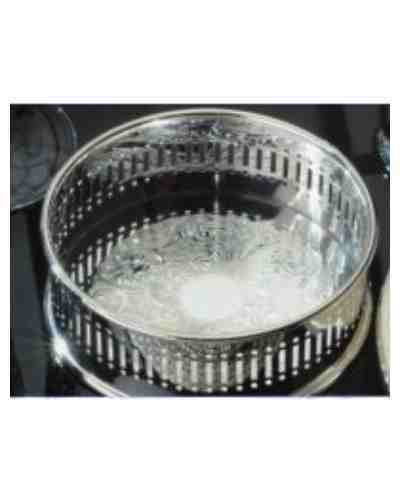 These are good quality 18/10 stainless steel items. Some people call them "Sporks", some say "Buffet Forks". Our term for them is "Party Forks". Party forks are combined knives, forks and spoons, all in one single piece. They can be used by fast food restaurants, schools, backpackers and for airline meals. They are a lightweight and space-saving alternative to carrying a knife, fork and spoon. Engraving / Personalisation Service for items such as bowie knives, pocket knives, cutlery, goblets, cups, trophies, flasks, salvers, tankards, trays etc. We can engrave your own items as well as items bought from us. Dates, logos, messages, initials etc. Do your knives need re-handling? Would synthetic handles look better? Cabinet interior re-laying? Polishing and sharpening services are also available. 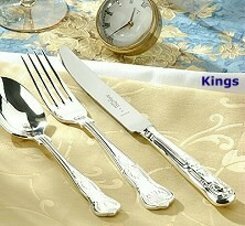 Here we are able to offer you the ability to have your cutlery/flatware restored to near the condition it was when originally purchased. 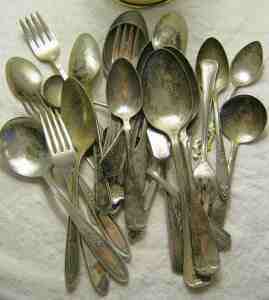 Send us your old cutlery and we will have it repaired and refurbished. Trade in your old cutlery for 10% Off your brand new replacement order. Don't Throw Away Your Old Cutlery; Get a brand new matching set in exchange and save money. 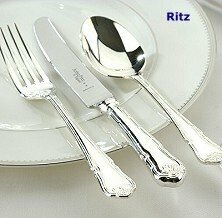 Upgrade all your old cutlery, get new instead and get a discount on the price of new cutlery into the bargain. We will send you brand new pieces one-for-one at 10% off the normal prices. We can refer you to professional firm of Valuers. 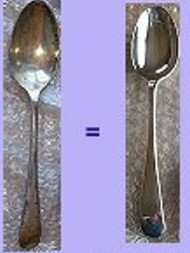 You may consider it worth getting your cutlery, flatware, silverware and any number of other similar products properly assessed. Let some of the world's foremost experts give precise valuations for your items. Photos and descriptions required. Expert Valuation Report within 48 hours of submission.